Before beginning the action I would like to thank couple of people (it’s more than couple) who inspired me to come up with this. Sudhir, for asking How can I run a VB Script in Workspace. Jomish, for inspiring to get it done. Cameron Lackpour, for providing the hint. I’m someone who likes Essbase a lot and I told myself “First figure out how to run a MaxL script in Workspace, running VB script will be solved automatically”. I figured out that MaxL can be imported as jobs from Cameron’s post, and later found that all jobs require a job application. Jomish helped me understand the Job service and here we are. Follow the steps given below, and you can run MaxL scripts in Workspace. 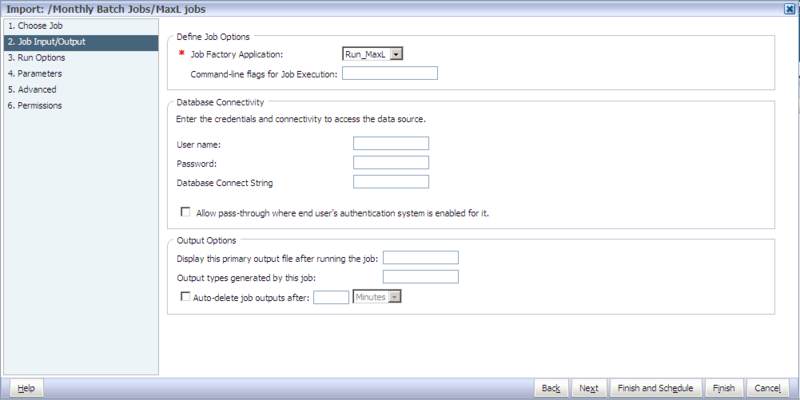 Provide a Product Name (this is the name that shows up (Job Factory Application) when importing a job. Type $CMD $PROGRAM, you can also click the buttons to insert Command Template. 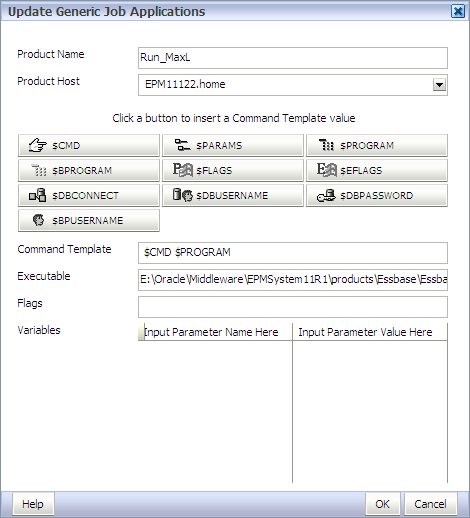 Provide the full path of essmsh.exe as the Executable. 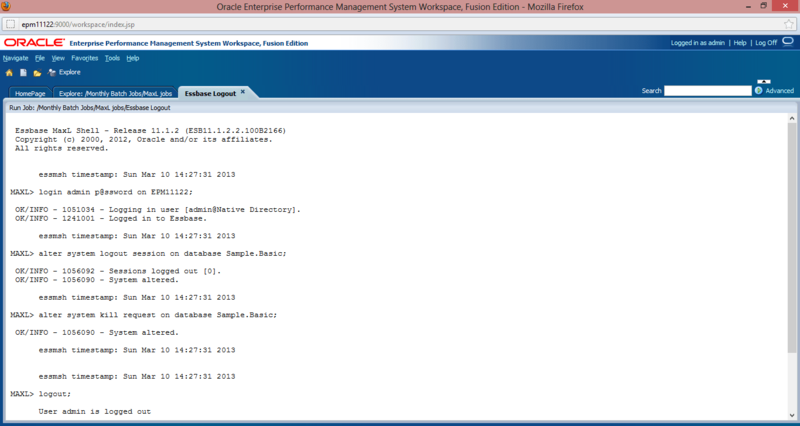 Essbase client should be installed on Workspace Server. The MaxL script will be executed on Workspace server. If you are spooling (spool command) in MaxL, then make sure that Workspace server has that folder. To Run Bat is easy! You can create a Task Flow to do that! Good Post.I am implemneting similar solution at one client.How do we do this if the user do not wish to see the password after the running the job. I have created public/private key using gk option and then encrypted the file too. It works fine with .bat file but How do I implement it using workspace. great idea, but it doesn't seem to work for me, just hangs on the "Running … job". Any ideas? @anon please check http://www.orahyplabs.com/2013/04/run-batch-file-in-workspace.html this shows how to run a bat file. @anon send me the screen shots of how you did it, so that I can look at why it is not working. I am trying to run batches from workspace, but my also hang. Is there any one thing that you have found that would cause this based on the threads above? @anon I would be able to comment on that since I don't have any information about your setup. I've it working on windows. Someone else I talked to last week have it running against Linux. If you want to get variable value as your generic job's parameter/prompt value. How can you set it? thanks. 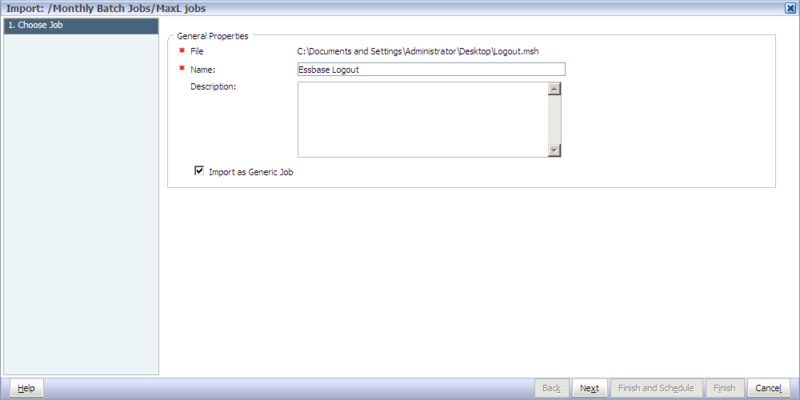 I've not tried it, however if you look at the job properties you can declare the variables there. When running a maxl script from workspace, it timed out. 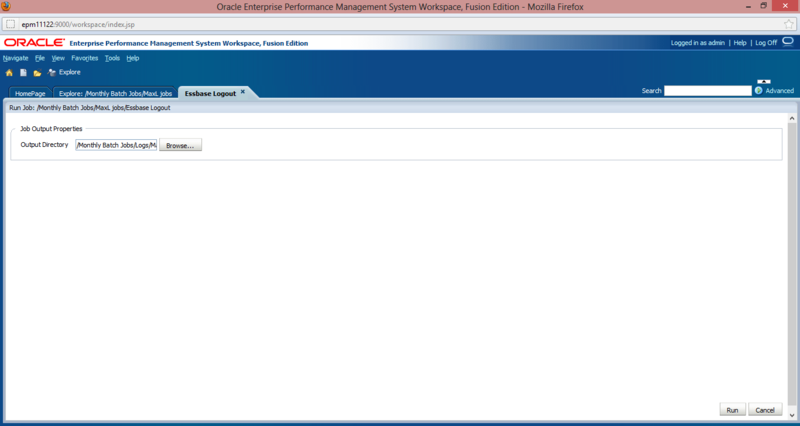 It says page cannot be displayed but when i check the EAS i could see the process still running. Any ideas? I've just used the parameter/prompt thing and it works. When creating the generic job, you declare variable names. Then, when importing your MaxL script, you add a parameter with a prompt matching the variable name (not tested if this matching is necessary), and your batch get it as %1 (I suppose your MaxL would get it as $1). Actually, I tried using $1 as a parameter to the shell script. It is not working. Another problem which I find is that even if $1 works and I enter its value there, it's kind of a hard coding. That is not serving my purpose. Either I am doing something wrong or this does not work. I am not calling a Maxl, I am calling a shell script. Shell Parameter is $1, did you try using $1 as parameter? You'll have to create a job application with $CMD $PROGRAM $PARAMS as template. thanks for this post. very useful! is it possible to load a file that is stored in workspace? How do you navigate to the screen where you Import a MAXL script ? I did the first step of Updating a Generic Job Application then clicked okay but it did not take me to another script. Then I spent the next 30 minutes trying to find the screen to import the Maxl Script. Any help would be greatly appreciated. Did you clock? Is it taking a long time to run the process? The script took about 7 mins to complete and the error pops out in about 5 mins. I am not hitting server is not responding with a HTTP 500 or 404 errors. i am hitting with page cannot be displayed error and i found out in httpd.conf file "KeepAliveTimeout was set to 5" whether i need to update this and restart the services. Before doing that, can you create a simple MaxL (maybe just login, display all applications and log out) and see if that works. Hey Celvin, I’m setting up running Maxl from workspace and you mention spooling to a Workspace Folder , but I can’t seem to figure out what to put as the spool location so it goes into workspace? Any help is appreciated. By spooling I meant not the spool of MaxL, workspace itself keeps a log output.